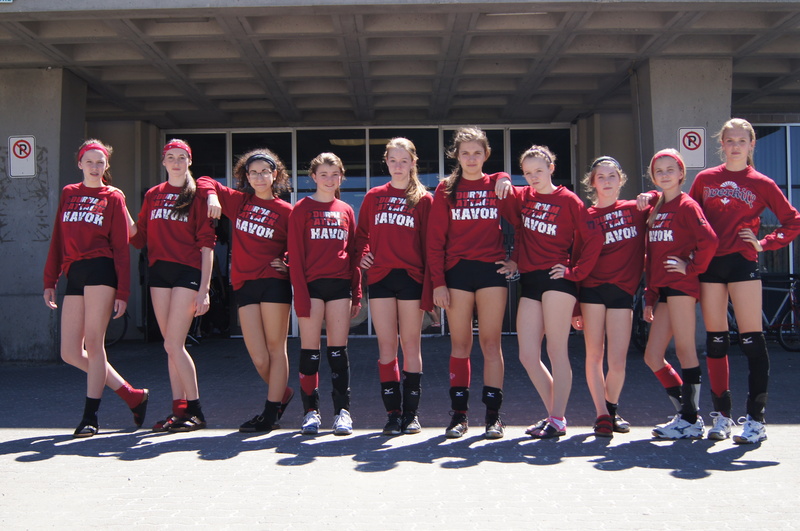 Sherbrooke, Québec – The Durham Attack Havok girls’ volleyball team have taken the Canadian eastern 14U volleyball title. The Havok were one of 32 teams from Ontario, Québec, New Brunswick and Nova Scotia competing at the Canadian East Open in Sherbrooke, Québec the first weekend in May. The Attack Havok went the entire weekend without dropping a single set and defeated the Georgetown Impact in the gold medal game 25-8, 25-14. Havok recently took the prestigious Ontario provincial title and were heavily favoured to medal in the eastern finals. While players admit that facing teams from the other provinces was a great experience, Ontario is truly a powerhouse in this current age group with the final four teams all hailing from their home province. The Havok were even able to celebrate their win with their sister team, the Durham Attack 15U Black, who also won their National title that same weekend – a true testament to the strength of the Durham Attack Volleyball Club’s development program. This final competition wraps up an incredible season for the Havok who have an almost perfect record in their 14U season earning gold in all but one competition where they settled for the silver. Havok players are Ashley Forgie, Bianca Cirone, Carleigh Semeniuk, Kaitlyn Hancock, Kelly Schaefer, Kendal Whyte, Maddy Jenkins, Megan Murphy, Soleil Puusa and Taylor Butcher. The Havok are coached by Chris Dunn and Mike Cirone.